A record amount of beach rubbish has been collected by volunteers in the Isle of Man, a charity has said. More than 180 bags of litter were cleared from Ballaugh in one day - more than double the previous largest amount gathered by the Beach Buddies group. Founder Bill Dale said all previous records were "smashed to bits" and he was "overwhelmed." 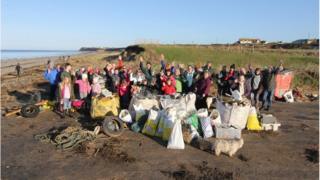 More than 120 volunteers attended the clean up - 40 more than the previous highest turn out. Mr Dale, from Andreas, who received the British Empire Medal for services to the Manx marine environment in 2017, said "massive" amounts of plastic had gathered since Christmas. He said: "I expected a good turn-out but the sheer number of people, and especially the number of families, was humbling. "There has suddenly been a lot of publicity lately about the way we have abused the oceans, and it's fantastic that people are now starting to take notice and show that they care, but this was totally unexpected. "We are setting worldwide standards in the Isle of Man." Mr Dale established the charity with the aim of making the island's coastline "the cleanest in Europe." The charity, which celebrated its 10th anniversary in 2017, has worked with nearly 10,000 volunteers and collected thousands of tonnes of debris.